Zion Market Research has published a new report titled “Database Automation Market by Database (Hierarchical Databases, Network Databases, Relational Databases, and Object-oriented Databases), by Deployment (Cloud, On-Premises, and Hybrid), by Component (Solutions and Services), by Application (Finance, Operations, Human Resources, Sales & Marketing, and Information Technology), and by End-Use Industry (Transportation, Automotive, IT & Telecom, Retail, Government Sector, BFSI, and Others): Global Industry Perspective, Comprehensive Analysis and Forecast, 2017–2024”. 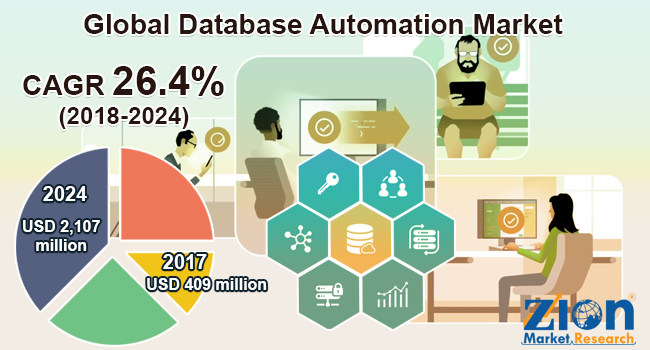 According to the report, the global database automation market accounted for USD 409 million in 2017 and is expected to reach USD 2,107 million globally by 2024, at a CAGR of around 26.4% between 2018 and 2024. Data automation uses technology and devices to undergo various processes with minimum human interference. Automating databases reduces errors and costs and provides timely services to customers. Automotive manufacturers are focusing on manufacturing and supplying vehicles on a global level. An increasing number of manufactured vehicles has enticed the requirement for database management solutions. In 2017, nearly 97 million vehicles were manufactured, about 2.3% more than 2016. Owing to their global presence, major industry players, such as Audi, BMW, and Ford, require database automation solutions to manage data effectively. Furthermore, Ford is also using cloud computing to enhance the consumer experience. Thus, the database automation market is expected to register huge growth over the estimated period. Information and communication technology (ICT) industry has grown significantly in the past decade. In 2015, the global revenue generated by the sector was about USD 4,400 billion as compared to USD 3,433 billion in 2010. Furthermore, the increasing number of offshore development centers in developing economies such as India is driving the market. From 2000 to the first half of 2018, the Indian IT sector witnessed cumulative foreign direct investments worth USD 32.23 billion. These investments are anticipated to increase over the forecast timeframe leading to the augmented demand for database automation solutions. The database automation market is divided based on database, deployment, component, application, and end-user industry. By application, the database automation market is segmented into finance, operations, human resources, sales and marketing, and information technology. Information technology is projected to hold a substantial share in the database automation market over the forecast timeframe, due to the growing IT and telecom sector. By component, the database automation market is bifurcated into solutions and services. The solutions segment is anticipated to grow notably over the forecast timeframe, due to digitalization in the Asia Pacific. Governments of India and China are planning to automate government procedures to simplify the services provided to their citizens. North America is expected to grow substantially in the global database automation market by 2024. The U.S. is projected to be the major contributor in the regional database automation market. In 2018, JPMorgan, the U.S. based key player in the finance sector, announced its tech budget of USD 10.8 billion for the year. Moreover, technological developments in the transportation sector are likely to drive the country’s automation demand. Organizations, such as DHL, UPS, and FedEx, use automation for streamlining their transport operations. Certain major players operating in the global database automation market are Oracle Corporation, BMC Software, Inc., CA Technologies, Micro Focus, Amazon Web Services, Inc., SAP SE, Microsoft Corporation, Datavail, IBM Corporation, Quest Software Inc., IDERA, Inc., Help Systems, LLC, Red Gate Software Ltd., WhereScape Software Ltd., and Datical, among others.